PhoboQuotable - New York Archbishop Timothy Dolan - Joe.My.God. “If you have been gay your whole life and feel that that’s the way God made you, God bless you. But I would still say that that doesn’t mean you should act on that. I would happen to say, for instance, that God made me with a pretty short temper. Now, I still think God loves me, but I can’t act on that. I would think that God made me with a particular soft spot in my heart for a martini. 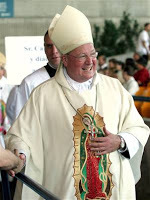 Now, I’d better be careful about that.” – New York Archbishop Timothy Dolan, comparing homosexuality to alcoholism in a lengthy New York Magazine article titled The Archbishop Of Charm.